Learning a language has never been this easy or portable before now! Simply put, you can learn an ENTIRE LANGUAGE with the help of the Partner EW900 or you can have it talk for you. The Language Teacher program provides language learning to the fullest, and will have you speaking in no time no matter what your level of experience is. Speech recognition and speech to speech translation modules will listen to your pronunciation of foreign words, phrases, and dialogues, giving you feedback along the way. The new U-Learn feature even lets you learn hands and eyes free! More than 5 language games and programs will ensure learning is not only interactive but fun. Don’t have time to learn? Well, then start communicating now! Voice activated phrases and a Full Text Translator will allow you to interact with people in your target language without having to learn it. All 14,000 voice-activated phrases are spoken in a real human voice to facilitate understanding. 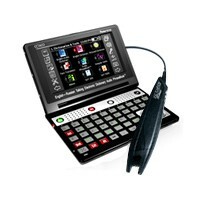 Partner EW900 also includes a massive human-voice talking dictionary. A full electronic translator, physical keyboard and touchscreen make the Partner P900 not only sophisticated but also extremely easy to use. The greatest resource out there for letting people know exactly what you want, whenever you want it! Loaded with 14,000 pre-programmed phrases, just select a topic, say a phrase, and the device will find it for you instantly. You can even browse topics and choose what you want to say to have it pronounced fluently for you. Built into every Partner P900 unit is the Universal Translator 183 (UT183). Imagine being able to translate between 183 different languages instantly; that's exactly what the new built-in UT183 will do! From Zulu to Urdu or Latvian to Yao, get bidirectional translations you never thought were imaginable! The following languages are supported: Achinese, Afrikaans, Akan, Alabama, Albanian, Spanish, Armenian, Aymara, Azeri, Balinese, Bari, Bashkir, Basque, Batak, Belarusian, Bikol, Breton, Buginese, Bulgarian, Buryat, Catalan, Cebuano, Chechen, Chinese Mandarin, Choctaw, Chorti, Chuang, Chukchi, Chuvash, Creole, Crimean, Croatian, Czech, Dakota, Danish, Dungan, Dutch, Dyerma (Zarma), Efik (Ibibio), English, Erzya, Esperanto, Estonian, Evenki, Ewe, Faeroese, Fang , Farsi, Fijian, Finnish, Foochow, Spanish, Frisian, Fulani, Gagauz, Galician, Gan, Ganda, Georgian, German, Greek, Guarani, Hainanese (Min Nan), Hausa, Hebrew, Hiligaynon (Ilonggo), Hindi, Hmong, Hunanese (Xiang), Hungarian, Icelandic, Igbo, Ilocano, Indonesian, Spanish, Japanese, Javanese, Kalenjin, Kamba, Kaqchikel, Karaim, Karakalpak, Karen, Kashubian, Kazakh, Khakas, Khanty, Kikuyu (Gikuyu), Kinyarwanda, Kisii (Gusii), Komi, Korean, Koryak, Krymchak, Kumyk, Kurdish, Kyrghiz, Latin, Latvian, Lingala, Lithuanian, Lombard, Luo (Dholuo), Maasai, Macedonian, Madurese, Makassar, Malay, Maltese, Manado, Mansi, Maori, Mapudungun, Mari, Medanese, Minangkabau, Moksha, Mongolian, Nanai, Navajo, Ndebele, Ninglish, Nivkh, Norwegian, Nyanja (Chichewa), Ojibwa, Panay, Papiamento, Spanish, Portuguese, Provencal, Quechua, Romanian, Romansh, Runasimi, Rundi, Russian, Samoan, Sango, Sara, Scots, Sepedi, Serbian, Shona, Sichuanese, Sidamo, Silesian, Slovak, Slovenian, Somali, Sotho, Spanish, Sundanese, Swahili, Swati, Swedish, Tagalog, Tajik, Tatar, Teochew, Teso, Thai, Tonga, Tsonga, Tswana, Tumbuka, Turkish, Turkmen, Uighur, Ukrainian, Urdu, Uzbek, Venda, Vietnamese, Winnebago, Wolof, Xhosa, Yakut, Yao, Yolngu, Yucatec, Zulu. Headphones with mic, USB cable, Bonus CD, Adapter, Rechargeable battery, Pouch and C-Pen scanner are included in the standard package.